Again in Marbella, Spain. Novak Djokovic enjoyed on Saturday, August 4th, 2018 some days off with his wife Jelena, his children Tara and Stefan, and his brother Marko. The Serbian player has been spotted strolling around the beach and training at the tennis court located in Puente Romano Beach Resort & Spa preparing for the Toronto's Rogers Cup that starts this week. Returning to Marbella to recharge his batteries and train for the upcoming Canadian Open 'Rogers Cup' Novak Djokovic is back in Costa del Sol. Some Marbella citizens were surprised this weekend when they caught, one of the world’s greatest tennis player Novak Djokovic training using his budgie smugglers at Marbella's promenade. The world N10 enjoyed a few days in Monte Carlo training with tennis pal Grigor Dimitrov before moving to Marbella, where he owns a house, with his wife Jelena, son Stefan and daughter Tara. Djokovic new's way to beat the scorching summer heat turned out to be a funny surprising way for the many people that were in the area. The friendly Serb kindly agreed to let people take a few photos which naturally found their way on to social media rapidly. 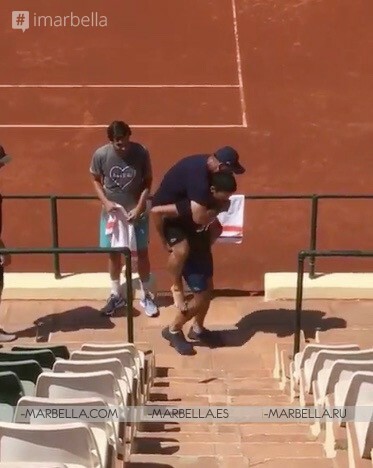 As we know Novak is very keen to share some moments of his life on social media, he posted a video of himself training with Marian Vajda at the Puente Romano's clay court in Marbella. The Tennis star is very fond of Marbella and when possible he practices his tennis skills and Yoga at Puente Romano Beach Resort & Spa. 4TH August, he wrote ''*When I hit 4 million+ followers on the gram*#NoleFam thank you for being a part of my social media journey and continuing to support this #djoker. Love you guys''. His Instagram video shows his gratitude towards the fans for reaching out to 4 million followers. The video was made in his second house in Marbella. Novak Djokovic who is currently ranked as the world's number 10 player recently claimed his 13th Grand Slam winning the title at Wimbledon after beating the Spaniard Rafael Nadal in the semifinals and Kevin Anderson in the final. 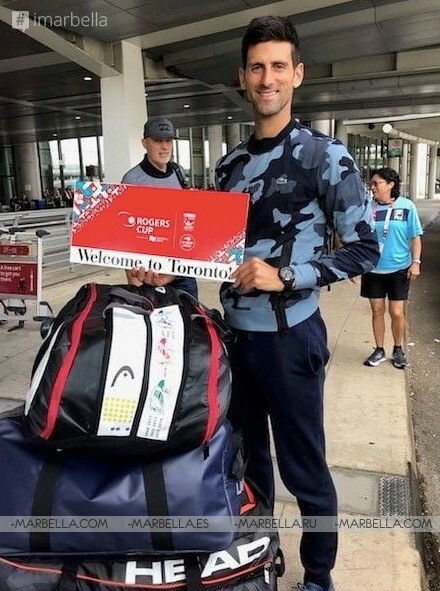 Djokovic has arrived in Toronto on Saturday, shorty to play in the Rogers Cup before the US Open begins on August 27. Marbella has had a long association with the field of the tennis world, including Manolo Santana 'Manolo Santana Racquets Club' featuring a large selection of Padel & Tennis courts, Gym, Yoga, Sauna and more. And year-round tournaments and Tennis Academies under the management of tennis legend Bjorn Borg. Be part of Marbella present, past, and future! Leave your stamp on Marbella fascinating and spectacular history! i-Marbella.com - recording highlights of the chronology of events, people, places in Marbella, Costa del Sol, Spain. We are moving to the video format! So make sure to follow us on YouTube to stay updated and on trend with the best videos, interviews, and information about the city of Marbella and all Costa del Sol! No comments were found for this article! World No.2 Tennis Star Novak Djokovic Spotted in Marbella! Annika's Blog: Golden Stevia- Healthy Sweet Life is 100% possible! Karina Miller Blog 11: Visiting the icon Burj Al Arab, Dubai's infamous 7-star hotel. Golden Stevia powder as a Sugar Substitute: zero calories, healthy, and safe.